Today, April 11th, is the Feast of Pope St. Leo the Great, Confessor and Doctor of the Church. He lived during the fifth century and reigned as Sovereign Pontiff for twenty-one years. And in that time, he earned due veneration as a most humble and honourable shepherd, guiding his sheep in a manner fitting to the One he wholeheartedly followed, the God-man Himself. It was St. Leo who convened the fourth Church Council at Chalcedon in 451, which clearly defined Church Doctrine on the real nature of Jesus Christ, true God and true man. And it was his articulate eloquence and learning that provided the key contribution to formulating this Christological doctrine on the Incarnation. This would stamp out the heresies threatening Christendom of his time and proclaim St. Leo as the great Pope he was. St. Leo the Great, it is written, was born in Tuscany. He received a first class education, particularly focused on theology and Holy Scripture, in which he excelled. So highly esteemed was he in his learning that when a dispute broke out between two generals in Gaul, the Emperor sent Leo, a simple archdeacon, to settle the matter. It was during this mission to Gaul that the Holy Father, Pope Sixtus III, passed away. The brilliance of this humble archdeacon being clearly recognised, Leo was, in turn, elected as Sixtus’ successor. Therefore, on returning to Rome, the young man was ordained a priest, anointed as Bishop, then enthroned as Sovereign Pontiff. And there he was to sit, upon the chair of St. Peter, from September 29th, 440 until his death on November 10th, 461. At the time of St. Leo’s enthronement, Rome had radically changed, from the pagan centre of culture to that of Christendom. The city was now seen as a spiritual and architectural Christian stronghold. And St. Leo extended this stronghold through his papacy to the entire Church. For he was the first Pope to position himself steadfastly as Christ’s representative, Head of Holy Church in all Christendom. And as such, he took firm measures to bring Christendom, East and West, under the auspices of Rome. One could say, therefore, it was this great Pope who brought Holy Church under full obedience to Rome. It was always St. Peter to whom he looked for guidance in his affairs. In fact, he believed that St. Peter was continually working through each of his successors. The Holy Ghost was bestowed upon all the apostles by our Lord’s breathing upon them, and that the blessed apostle Peter, raised above the rest, having already received the keys of the kingdom, saw the care of the Lord’s flock committed to his charge. As successor of St. Peter, he naturally saw it his duty to take full responsibility for “the flock committed to his charge”. This included the challenging of heresy. And during the fifth century, heresy was rife within the Church. For instance, Nestorianism and Monophysitism, which had the effect of either diminishing or denying the true nature of the humanity of Jesus Christ, were challenging Church teaching. It was the glory of Pope St. Leo, leading the Church towards a doctrinal definition on the true nature of Jesus Christ that successfully combatted these heresies. He took drastic measures, ensuring to rid the Church of false teaching, put forward by Eutyches, a monk from constantinople. Eutyches was concerned with combating Nestorianism. In his attempts, he championed Monophysitism, teaching that Christ held only one nature, Divine. And that Divine nature, according to Eutyches, being the greater, had completely absorbed Christ’s humanity. Just as salt, when dissolved into water, becomes unrecognisable, he held that after the Incarnation, nothing of Christ’s human nature was recognisable. Both the Patriarch of Alexandria and the Emperor himself followed Eutyches’ teaching, whilst the Bishop of Constantinople, Flavian, staunchly opposed it. A false council was even convened at Epheseus, in 449, proclaiming true this heretical teaching of Eutyches. The danger to the Church was immense. For this false doctrine naturally led to further heresies, such as a disbelief in the Redemption of humanity and in the real presence in the Holy Eucharist. Pope Leo wrote a long, detailed letter called a tombe, in support of Bishop Flavian, explaining carefully the theology of the true doctrine of the nature of Christ. Yet, his letter was suppressed by the Patriarch of Alexandria. St. Leo, therefore, called immediately for a Church Council, which convened at Chalcedon, in 451, bringing together the largest group of Bishops the Church had ever seen. There, the doctrine of the Incarnation was clearly and categorically defined. Jesus Christ, it claimed, has two natures, Divine and human, which coexist “inconfused and undivided”; in other words, these two natures exist, without separation and without confusion, within the person of Jesus Christ. The major contribution to the formulation of this definition came from St. Leo himself. For his tombe, clearly outlining the true doctrine of the Incarnation, was used to compose this great new dogma. And that put an end to both Nestorianism and Monophysitism within the Church. Majesty is allied to lowliness, power to weakness, that which is mortal to that which is eternal … an inviolable nature to a passible nature … The true God is born in the integral and perfect nature of a true man, entirely with all that is His, entirely, too, with all that is ours. Having worked to order the Church in the East, the Western Empire was now under threat. For Attila the Hun was raging his way down through Europe, arriving with his army in Italy, threatening Rome. St. Leo met with the barbarian and sought an agreement, whereby the Hun and his army retreated. 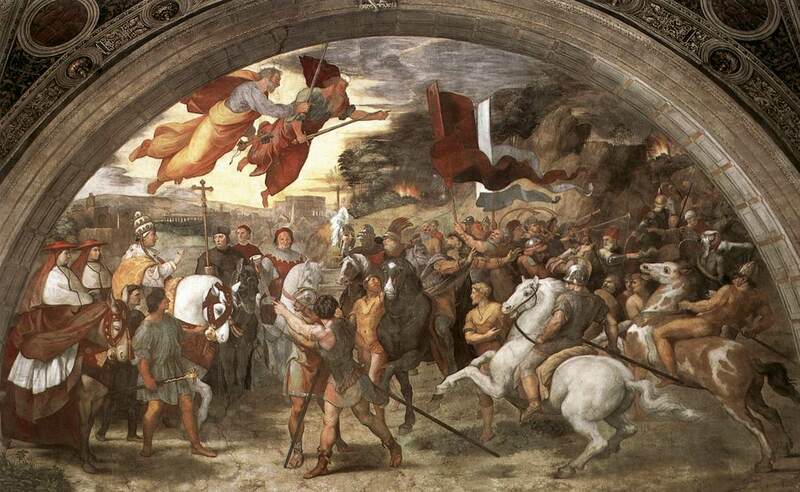 The Meeting of Leo the Great and Attila by Raphael. Tradition has it that Attila withdrew, in awe of this great Pontiff. For he apparently witnessed a vision, where Saints Peter and Paul stood one either side of St. Leo. As Attila began his return journey northwards, he was suddenly taken ill and died. So aggrieved was his wife, that she sent word to the African king, Geiseric the Vandal, to avenge her husband’s death. Geiseric responded, coming to Rome with an army. St. Leo once more sought to resolve the conflict himself and met with Geiseric. This time, the result was less favourable and the Vandal looted the city, taking hostages, yet refrained from burning and killing. With Chalcedon and the threat of invasion behind him, St. Leo was left to rebuild Rome after the Vandal’s plunder and free his captured citizens. He then continued his work of further consolidating papal primacy, raising Rome’s standing over and above the other major Sees of Christendom. For him, this was not about worldly power. It was about lifting Holy Church and her mystical body, his flock, to join with its Head, Christ Himself. In other words, Christendom, as he saw it, needed to become a true reflection of the Heavenly Kingdom, in order to fulfil her true mission. Holy Church must therefore be an expression of eternity, guiding Her members away from earthly distractions and temptations. As Sovereign Pontiff, his duty was to steer Christendom in this direction. And his path of action was clear. He would encourage each member of his entrusted flock to embrace the blessed poverty of spirit. So he fervently preached on the practice of alms giving and holy fasting, which humble the person, bringing them deeper into union with Jesus Christ, Whom we must all imitate and follow. He also emphasised the importance of giving due honour and thanksgiving to God, for without Him, we receive nothing. St. Leo apparently spent many hours praying before the tomb of St. Peter, imploring the aid of the Prince of the Apostles. And when he died on November 10th, 461, his body was laid in the Church of St. Peter in Rome. He received his title as Doctor of the Church, from Pope Benedict XIV, in 1754. But it was his zeal in pronouncing the true Doctrine on the Incarnation of Jesus Christ, along with his allegiance to his duty as Father of all Christendom, whereby he established Rome as the seat of power and authority within the whole Christian world, as well as protecting Rome from invasion that he became known as St. Leo the Great. All the while, aiming to humble himself and his entrusted flock, by following the very footsteps trodden by the God-man Himself. Pope St. Leo the Great, pray for Holy Church. Pope St. Leo the Great, pray for the Papacy. Pope St. Leo the Great, pray for the Holy Father. Pope St. Leo the Great, pray for us. This entry was posted in Kim's Weblog and tagged Liturgical Year, Saints. Bookmark the permalink. Post a comment or leave a trackback: Trackback URL.